This is what I ate for supper tonight. It was one of those days when the fridge was bare. Well, apart from a forlorn fennel bulb and some cherry tomatoes, so I had to use a bit of imagination! I made a cardamom-spiced wild rice pilaf with sultanas and almonds and simply blanched then roasted the fennel (with the tomatoes and some garlic) until the edges curled up and caramelised - it always surprises me just how delicious roasted fennel is. I also sprinkled on some Parmesan just towards the end of cooking, which made it even stickier. Not bad for an empty fridge supper and, bonus, I unintentially took part in a Meat Free Monday – this is what it’s all about. Preheat the oven to 200˚C. Trim the base and top off 1 Fennel Bulb, cut in half and then cut again into 4 thin slices. Parboil for 4 minutes, drain, and place in a baking tray. Add a handful of Cherry Tomatoes and a few unpeeled but smashed Garlic Cloves. Drizzle with olive oil and place in the oven for 20 minutes. Meanwhile, melt a knob of Butter in a small saucepan and add 60g Wild Rice, 3 Cardamom Pods and a Bay Leaf. Stir to coat and then pout in enough boiling water to just cover the rice. Simmer for 15-20 minutes until cooked. Sprinkle a handful of Parmesan Cheese over the cooking fennel and return to the oven for 5 minutes. Drain the rice and discard the cardamom and bay leaf. Into this stir1 tbsp of Flaked Almonds, 1 tbsp Sultanas and a knob of butter. 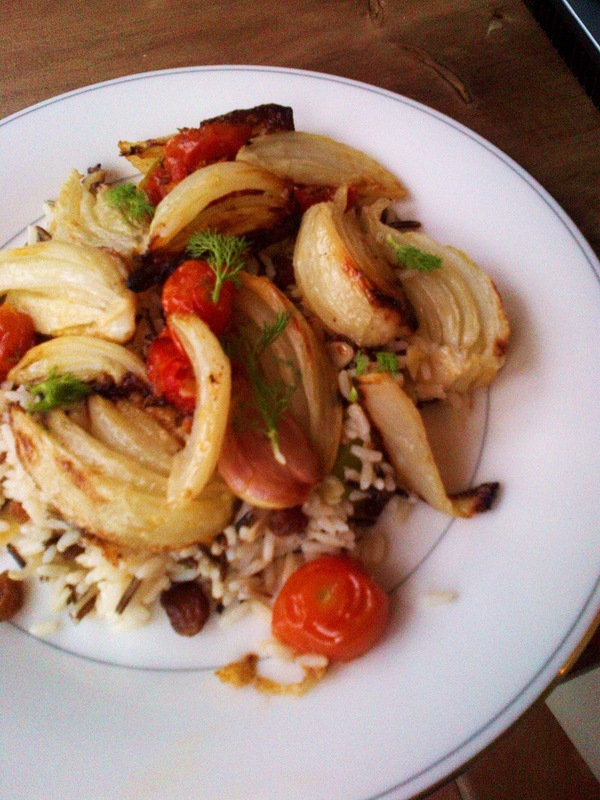 Spoon onto a plate and top with the sizzling fennel and tomatoes. Sprinkle any spare fennel fronds over the top and serve. With Easter Sunday just around the corner, I wanted to bake a chocolate cake for visiting friends but a different one to the usual chocolate fudge cake recipe I use. This time I wanted something more sophisticated and torte-like, that I could top with crystallised flowers for a pretty, springtime look. Again I used a Mary Berry recipe, this time her ‘Queen of Sheba’ cake, so-called due to the crown-like chocolate shards that adorn it. It is a fab recipe, swiped from a Julia Child recipe who in turn took hers from the first French cake she ever ate (and remained her favourite). I suppose recipes are all about passing on and reinvention - I even adapted Mary's icing by adding in some cream cheese to give it a thicker texture. The cake sponge takes a bit more concentration than a simple victoria as it is more of a chocolate mousse batter with almonds which makes it deliciously light and nutty. You could make two and sandwich them together, but somehow a one layer cake seems more understated and leaves room for a thick layer of creamy icing. At the moment the garden is awash with pansies in mauves, purples, yellows and creams. Their little heads carpet beds, poke from urns and circle daffodils - it really is so pretty, and all down to my very talented mum (I just don't have the patience). So I felt she wouldn't miss half a dozen as they are perfect edible flower decorations when crystallized. Other edible flowers you can use for crystallising include rose petals, chrysanthemums, marigolds, violets and primroses. Mary Berry makes dark chocolate shards which look fantastic in her photo. I opted to use white chocolate as it seems more Easter friendly and went well with the flowers. A dusting of cocoa powder also looks great on the white, creating a kind of reverse Mont Blanc effect. Needless to say, only crumbs survive! Preheat the oven to 180˚C and line a 20.5cm sandwich tin with baking paper. Gently melt 100g Dark Chocolate in a bain marie with 2 tbsp Strong Coffee, stirring occasionally. Leave to cool. Beat 100g softened Unsalted Butter until creamy. Gradually add 100g Caster Sugar, beating until pale and fluffy. Continue beating and add 3 large Egg Yolks, one at a time. In a separate bowl, whisk the left-over 3 Egg Whites until frothy. Add a good pinch of Cream of Tartar and Salt and continue whisking until soft peaks form. Add 2 tbsp Caster Sugar and whisk until stiff peaks form. Using a large metal spoon or spatula, fold the melted chocolate into the butter mix, followed by 50g Ground Almonds and ¼ tsp Almond Extract. Fold in ¼ of the Egg Whites. The fold in 65g Plain Flour in two stages interspersed with the rest of the Egg Whites. Spoon into the tin and spread evenly. Bake for 20-25 minutes or until a skewer placed halfway between the edge and the centre comes out clean – the centre needs to be slightly undercooked for it to be perfect. Cool for 5 minutes, then turn out and cool completely. To Ice: Melt 100g Dark Chocolate with 1 tbsp Strong Coffee as before. Take off the heat and gradually whisking in 80g Unsalted butter. Continue whisking until the mixture has cooled and thickened. Then add in 50g Cream Cheese, whisking until smooth. Spread over the entire cake. To make the shards: Melt 75g White Chocolate over a bain marie. Pour the molten chocolate onto a sheet of baking paper and, using a palette knife, spread the chocolate thinly. Leave to set in a cool place (not in the fridge) then break into shards. To make the crystallised flowers: gently brush with egg white and dip in caster sugar. Leave in a cool place for a couple of hours until stiff.